Many people like when their significant others go to conferences, it means they get to see a new city. PowerShell on the River should be no exception! Chattanooga has great scenes, outdoor activities, and great tourist spots. Here are some of my favorites to share with people visiting from out of town divided up by category. Hiking – Chattanooga has many hiking trails hidden within its city and mountains. Visit rootsrated.com to find trails that interest you. Biking – Hope on one of our bikes provided by Bike Chattanooga to have a self paced tour of Chattanooga’s downtown scene. Rock City – Ever wondered why you see red barns with the words “SEE ROCK CITY” on them? Go find out what all the fuss is about! Ruby Falls – Chattanooga’s hidden gem. Tennessee Aquarium – Each major city in Tennessee has “that one” structure or experience that sets it apart from the rest; so much so that it’s even on our drivers license! Nashville has the AT&T “Batman” Building, Memphis has a pyramid, Knoxville has the Sunsphere at World’s Fair Park. Chattanooga has the Tennessee Aquarium. The Chattanooga Choo Choo – Glenn Miller would be taken back to see the renovations we have done to the historic Chattanooga Choo Choo. Hunter Art Museum – Too much history for you? Need to fill that void with art? Tennessee Rail Road Museum – If you want to see Chattanooga but not walk or drive? You can ride one our our original trains. Champy’s – A classic amoung the UTC students. Great chicken! Coworkers and I think ourselves spoiled when managers cater from here. Aretha Frankensteins – This is a go to for any third shift worker in Chattanooga. Pancakes! Need I say more? Tremont Tavern – If you plan to eat here, go before any dinner or lunch rush. The place gets crowded fast! 1885 Grill – Located south of downtown in a part of town called St. Elmo. Great local cuisine hidden from downtown. Community Pie – Forget chain pizza joints! Get a “home slice”. Taco Mamacita – Do the same to the chain Mexican joints while you are at it. City Cafe – I have to put this on here because it’s 24/7 and a large amount of food for the price you pay. A favorite for anyone who finds themselves awake in Chattanooga at 2am. Personally I don’t like it; there I said it! There are many more, to many to list in fact! Keep an eye out for the dinner channel in Slack for more options. Chattanooga has a rich history of prohibition… I don’t know the history, I just drink the alcohol. Chattanooga Brewing Company – Or CBC if you are a millennial. Not to be confused with CBC – Chattanooga Billiard Club for the non-millenials. Each category has more to offer. Don’t be shy. Ask in the Slack or catch me on Twitter @littlejohnPSH. 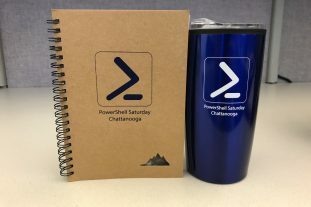 See you all in August for PowerShell on the River!